Enter the name you want for this personalized name necklace. 10 letters max, no numbers, no special characters. Thank you! 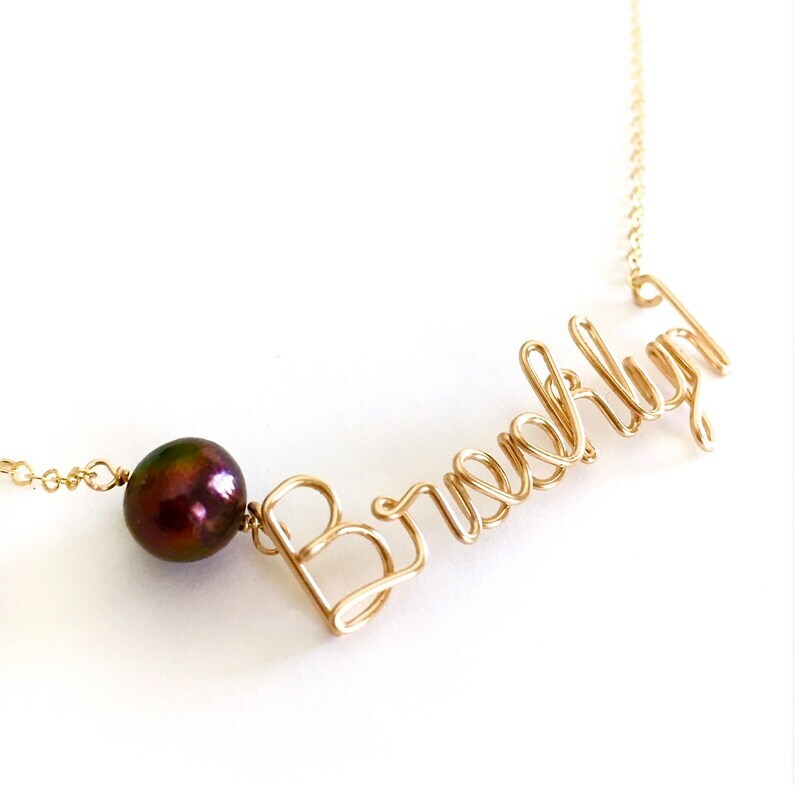 This Personalized Gold Name Necklace comes with a peacock colored black freshwater Pearl. Made from 14k gold filled wire, your new name necklace is hand formed, twisted, and hung on a delicate 14k gold filled cable chain. A large (approximately 10mm) off black freshwater pearl comes with this necklace in front of the name. The name portion alone is generally 1 inch to 2 inches wide, depending on how many letters you use up to 10 letters. Your necklace will arrive beautifully wrapped, ready for gift giving. Just leave me a note at checkout with the desired name. For names that are 10 letters or longer please message me for a price quote. What is 14k gold filled wire? It is 14 karat gold coated over alloy metal which may contain brass, nickel, steel and other alloy metals. It is not solid gold, therefore much more affordable, but still equally as beautiful and lustrous. It will last several decades or even a lifetime if cared for and stored properly wit the care instructions included. Need more than one word? Please convo me for a price quote/ special listing. Custom Rose Gold Name Necklace with White Freshwater Pearl. Personalized Wire Name Necklace. 14k Pink Gold Filled with Pearl Script Name. Rainbow Earrings. Swarovski Crystal Rainbow Earrings. Colorful Bright Dangle Earrings. Sterling Silver Colorful Crystal Silver Earrings. Rose Gold Brooklyn Necklace. Brooklyn Rose Gold Necklace. Urban Chic City Necklace. Dream Big Necklace. Dream Big 14k Gold Filled Necklace. Script Word 14k Gold Fill Necklace. Custom Wire Word Necklace in lowercase letters. Personalized Gold Name Necklace. Custom Gold Name Necklace. 14k Gold Filled Name Necklace. Communion Necklace. Girl Teen Gift Under 100. Rose Gold Name Necklace. Pink Gold Custom Name Necklace. Personalized Wire Name Necklace. 14k Rose Gold Filled Script Name Necklace.